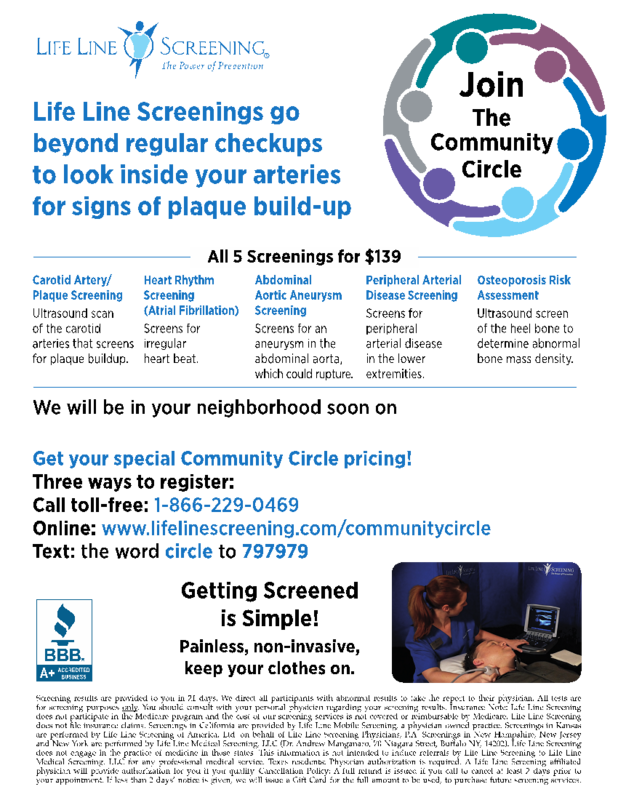 Life Line Screening, a leading provider of community-based preventive health screenings, will offer their affordable, non-invasive and painless health screenings. Five screenings will be offered that scan for potential health problems related to: blocked arteries which is a leading cause of stroke; abdominal aortic aneurysms which can lead to a ruptured aorta; hardening of the arteries in the legs which is a strong predictor of heart disease; atrial fibrillation or irregular heart beat which is closely tied to stroke risk; and a bone density screening, for men and women, used to assess the risk of osteoporosis. Register for a Wellness Package which includes 4 vascular tests and osteoporosis screening from $149 ($139 with our member discount). All five screenings take 60-90 minutes to complete.